When I think of Rudolph Ackermann, his Repository of Arts, Literature, Fashion, Manufactures, etc. immediately comes to mind. This journal was published from 1809 to 1829 and gives us an excellent window on the Regency world. Before the Repository appeared however, Ackermann (originally trained as a carriage designer) was publishing prints and colour-plate books like The Microcosm of London and Doctor Syntax. And earlier still, he was supplying artists, amateur and professional, with supplies for watercolour painting. 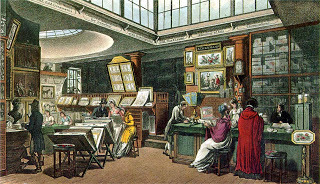 In the wonderful picture of Ackermann's shop, prints, pictures and books are clearly visible on the left. On the right, behind the counter and the assistant working there are cupboards which appear to be full of small items. I believe those cupboards held Ackermann's artists' supplies. 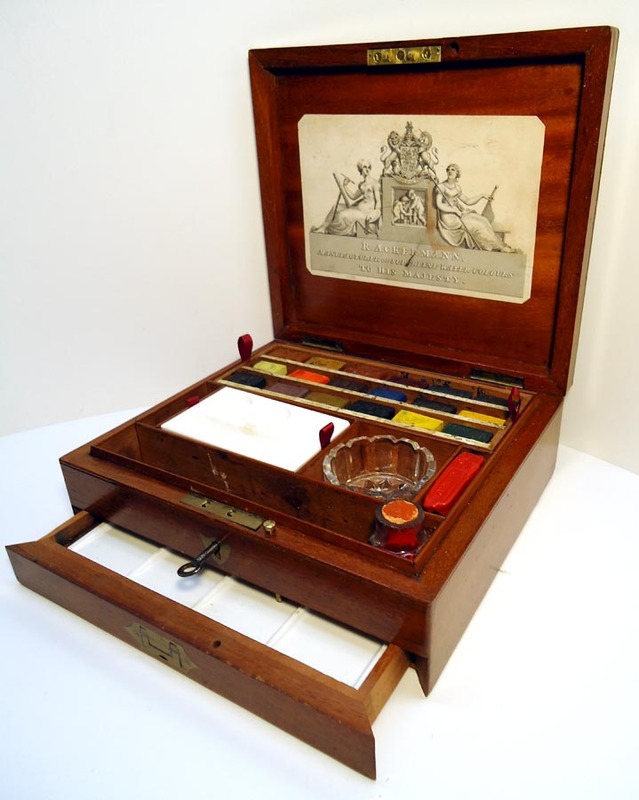 In 1799 Rudolph Ackermann began manufacturing and selling his own watercolour paint blocks. He was supplied by other colourmen but at least three colours were his own mixture, Ackermann's Green, White and Yellow. 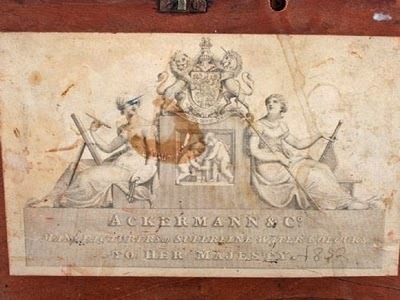 From 1817 his eldest son Rudolph Ackermann junior was responsible for the watercolour manufacturing. An advertisement in the Repository in 1818 gives a complete look at the watercolours offered for sale. The image above of watercolour blocks and the image below of the paint box are from the website of whimsie.com where there is an excellent 'Virtual Museum of Watercolour Materials'. Ackermann also had for sale brushes, and pencils and in later years, canvases, papers and even some supplies for oil painting. At the bottom of the advertisement above there is a note offering 'Boxes of Colours for Velvet-Painting". The advertisement above also indicates mahogany painting boxes were available. The Regency world would have been much the poorer if Rudolph Ackermann had not emigrated from Saxony in the late 1700s. His influence was wide-ranging, and who knows how many of the pictures that we enjoy of Regency Britain were painted with his watercolours. The London Museum and Institute of Natural History was a privately-owned museum, reported to house nearly thirty thousand articles, all from the natural world of the British Isles. It existed for only ten years. It was a scientifically based exhibition and its cases of specimens used the Linnean system of classification developed only some sixty years earlier. A catalogue was published for the museum and its first page expands on the above advertisements . The founder of this museum was Edward Donovan: avid collector, amateur zoologist, talented artist, and successful author. He was born in 1768 in Ireland, removed to London at an early age and left it only occasionally for short excursions around England and Wales. He was a prolific writer and illustrator, publishing at least ten fully illustrated volumes of work, which were very successful. He also contributed artwork to many of the natural history journals and cyclopediae current at the time. His most popular works were on the insects of China, India, and Australia. 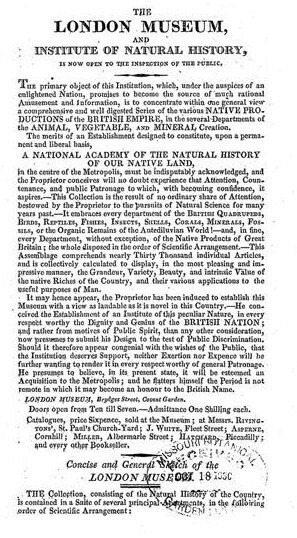 He did some local collecting of flora and fauna himself, but some of his British items and all of his world specimens were purchased from explorers and dealers. It was an expensive business, and he may not have been a very astute businessman. By 1817 his financial affairs were troubled, and he had to close his Museum. 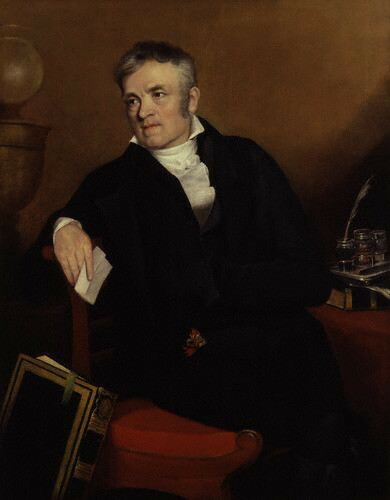 Edward Donovan died February 1, 1837. His financial holdings had never recovered and his large family was left destitute at his death. We know little about his personal life other than this. He left a legacy of art and scholarship, but at what personal cost? Since then I have read a great many more Regency journals and magazines, and discovered that products for the hair were indeed advertised widely--even as excessively as they are today. The concerns also were the same--too much hair, too little hair, unsatisfactory colours, the problem of cleanliness, and the control of wayward locks. The advertisements I have found since 2011 indicate a modern desire to avoid a bad hair day, and a wealth of products to aid those in search of perfect hair. Products for cleansing the hair were the least advertised, perhaps because soap was still the most common tool. Colouring the hair seems to have been of great interest, which I find a little surprising for some reason. There were hair salons, it seems. For the latest cut or 'do, Vickery's was one, no doubt, of many. And finally, if you needed a little augmentation--some extensions perhaps?--there were wig-makers, who had perfected their craft in the previous century. Many people know of General Tom Thumb (Sherwood Stratton) and his wife Lavinia, who were among the most well-known American celebrities of the 1850s and 60s. Less familiar are the people of short stature of the Regency period. Chief among these people were Nannette Stocker and John Hauptmann. Conventional employment was difficult before our current era for people with differences and challenges in stature or physiology to obtain. In many cases they had to turn to 'exhibiting' themselves to make a living wage. While they were often treated with respect and admiration, the advertisements and articles make it clear that they were not regarded as people in any ordinary sense, but 'wonders and marvels'. Stocker and Hauptman were Austrians, both 'encouraged' into public performance as young people by their guardians. They were talented musicians, and one can only hope that they found satisfaction in impressing audiences with their musical performances. They toured Europe for many years, and there is a sixteen page booklet, of the era, in existence "The History and Travels of the Little Nanette Stocker and of John Hauptmann" which would make interesting reading. Nannette was reported to enjoy knitting and needlework, and when she died in 1819 she was buried in the churchyard of St. Philip's, Birmingham. 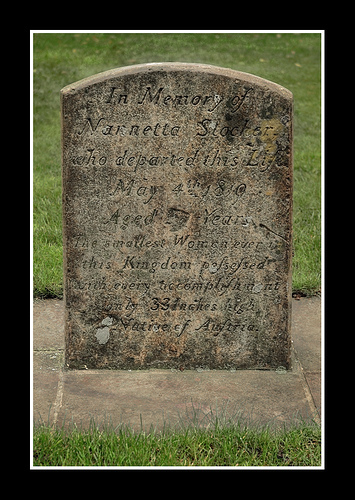 In memory of Nannetta Stocker who departed this life, May 4th 1819, aged 39 years. The smallest woman ever in this kingdom. Possessed with every accomplishment, only 33 inches high. A Native of Austria. Stocker and Hauptman were not the only renowned little people of the Regency era. British born Miss Smith and Mr. Leach impressed audiences with their beauty and their talents in 1816-1818. Such people were star performers at the great fairs of the day. Two decades earlier Mr. Thomas Allen and Miss Morgan were acclaimed in London. Their association had begun in the 1780s shortly after Miss Morgan (popularly known as the Windsor Fairy) was given the title Lady Morgan by the king. It should be noted that the 'average-sized' people in this 1804 illustration are disproportionately tall. How wond'rous are the Works of Nature. The poem is flattering in its way, but how much more gratifying it would have been if these people could have lived ordinary lives of their own choosing. All of the above publications are available free for download from Google Books. It's a beautiful summer day, and I fancy a little shopping. If we consult La Belle Assemblee, for the first months of 1807, we can find exactly the kind of shops that will interest us today. I always love a sale and it appears we can find one or two, in Oxford Street and Bond Street. Specialty items are always a treat. Lace, and shoes (possibly for husband or brother? ), and shawls--these stores might need a return visit another day! And for that writing case I bought at Middleton's (above) I'll need good writing paper. It was fortunate we brought the carriage; the shops are spread all over the City. What about one last stop in St. James Street--a new hat perhaps?